Get your First Name Bible Bookmarks at discount, wholesale, cheap. Over 25,000 names with meanings and a Bible verse that relates to the meaning. The meanings have been carefully researched and the Bible verses relate to the root meaning of the names. Bookmarks come in assorted gender-related photo backgrounds. "Sorry" but you cannot select the background style. Special names, different spelling than the 144 best selling names will be special ordered. Special names, different spelling than the 144 best selling names will be special ordered. Special names and names that we may be out of may take up to 2-4 weeks as they are shipped from the manufacture to us. 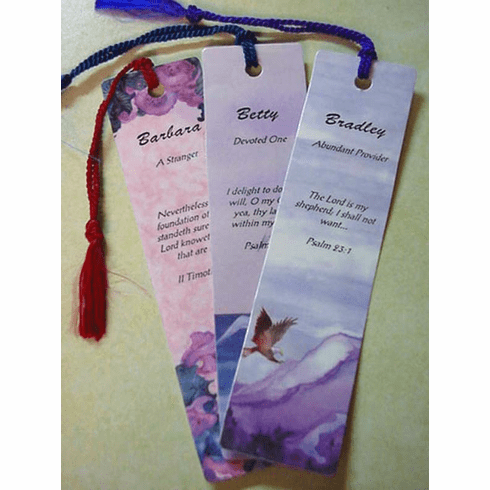 Get your First Name Bible Bookmarks at discount, wholesale, sale priced, inexpensive and even cheap.